My name is Manisha. I’m 20 years old and from Germany. I am currently in high school and on the weekends I work at a bar. In 2016/17 I was an exchange student in Finland. That’s where I learned to love hockey. My host parents took me to my first ice hockey game in Helsinki: Jokerit vs Jugra. I was immediately in love with the atmosphere at the stadium and the fans and just about everything. My host family also took me to an outdoor rink in our village a couple of times to play hockey, I was just about able to skate forward without falling so I was busy trying to coordinate my feet and the stick most of the time while everyone else was playing around me. After I went back to Germany I didn’t really keep up with the game, neither as a fan nor as a player. This January I felt the need to pursue a sport again, so I just bought a pair of skates and started going ice skating at public skating rinks 1-3 times a week. 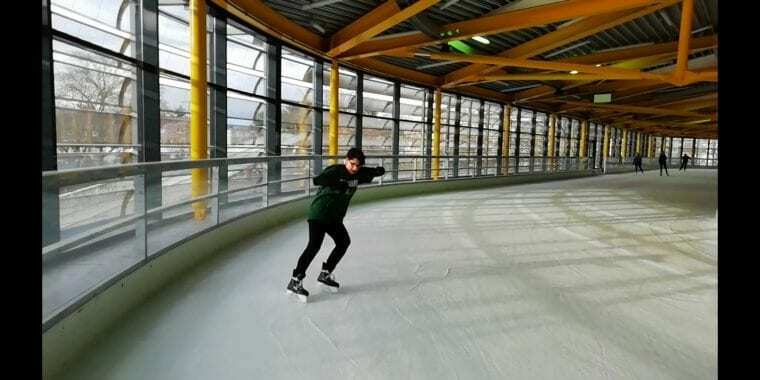 I promised myself that I would be good enough at skating so that I would have the confidence to join a rec team next season. Turns out I progressed a lot faster than I expected, so I already checked out one of the local teams and I have practiced with them a couple of times now. All of the guys are very supportive and encouraging of me when I fall or miss the puck. I immediately felt welcome. I won’t be part of the team this season because there are only two weeks left now, but I am looking forward to participating next season and I will give my best to train off the ice this summer. Every time I step on the ice, everything else stops mattering. It doesn’t matter how your day went or if you are a beginner or someone who was basically born with skates on their feet. All that matters is that you have fun and always try your very best. I don’t wanna miss that again. In the past, I struggled with being confident. I never saw myself as a sporty person. As a kid I never wanted to do any type of sports, but that changed a little when I was 12. I started fencing and continued to train for about three years. Then I quit and didn’t do any type of sport once again. Now I often lack confidence when it comes to sports. I was very worried that I would be too bad to play or that it would be too hard overall. The stories of WHL motivated me whenever I felt like I wouldn’t be good enough and inspired me to just go for it. I want to give something back. Maybe I will be able to inspire someone in a similar situation. I love the spirit of WHL and I am so excited to be part of something bigger! I’m looking forward to connecting with more women who share the same passion for the game and to share my own stories with all of you! I’m a very outgoing person so there are very little things people don’t know about me. I don’t think I have any secret talents or hobbies: I love to draw, I also play guitar, I read a lot… I believe that you don’t have to have talent or even be good at something to have fun doing it. Brigette Lacquette. I would love to talk to her about the struggles she’s had to face as a First Nations woman in hockey. She had to face barriers in her career but she knocked them down and didn’t let them get in her way. I admire that. Besides, she is an amazing hockey player and I would just love to get some tips for playing defence. Be your most authentic self so that everyone else around you feels safe to be as well. If you fall it means you have tried, so you get up and try again. I hope that one day, women will be looked at equally in hockey. That it will be just as normal to play hockey as it is for men. I want people to know that you don’t have to be that tough tomboy (you can be, of course but it’s not necessary) to play hockey with the boys. I hope that hockey overall will be a diverse sport where everyone can participate, regardless of gender, nationality, race, sexuality or age.